Lee Woolery|Miami Valley Today Troy’s Cassie McMullen bowls against Tippecanoe Thursday at Troy Bowl. Lee Woolery|Miami Valley Today Troy’s Carson Rogers bowls Thursday against Tippecanoe. Lee Woolery|Miami Valley Today Tippecanoe’s James Ridgeway bowls Thursday against Troy. 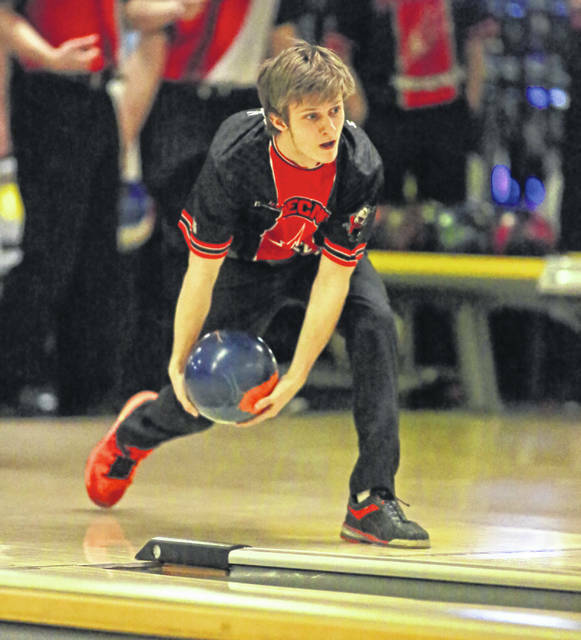 Lee Woolery|Miami Valley Today Tippecanoe’s McKenzie Dean bowls Thursday against Troy. Lee Woolery|Miami Valley Today Troy’s Preston Jackson bowls Thursday against Tippecanoe. 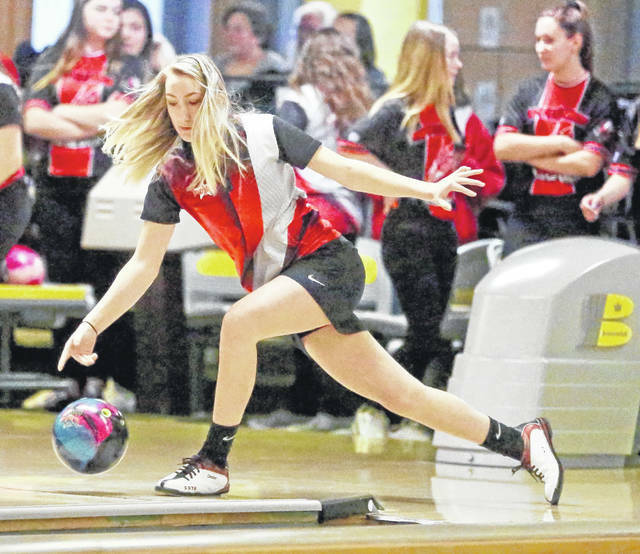 Lee Woolery|Miami Valley Today Troy’s Alyssa Shilt bowls Thursday against Tippecanoe. Lee Woolery|Miami Valley Today Tippecanoe’s Abbey Lee bowls Thursday against Troy. 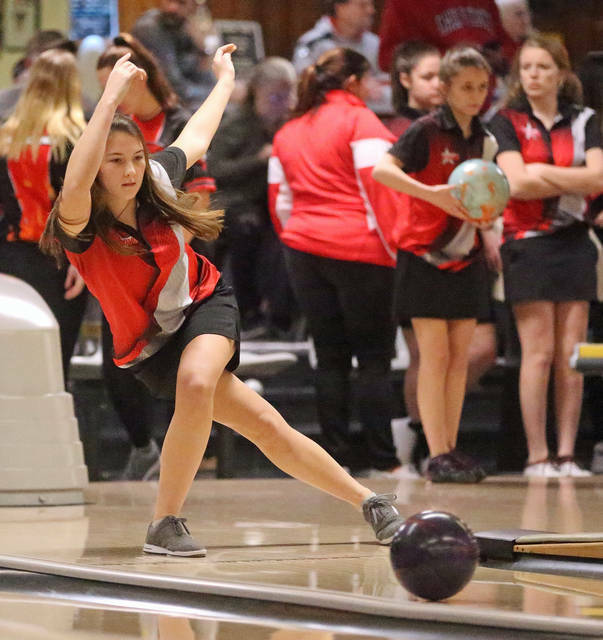 Lee Woolery|Miami Valley Today Troy’s Kayleigh McMullen bowls Thursday against Tippecanoe. Lee Woolery|Miami Valley Today Troy’s Drew Snurr bowls Thursday against Tippecanoe. 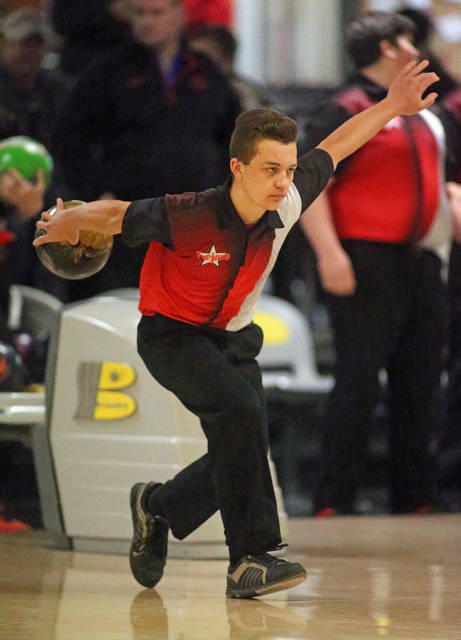 Lee Woolery|Miami Valley Today Troy’s Brayden Ganger bowls Thursday against Tippecanoe. 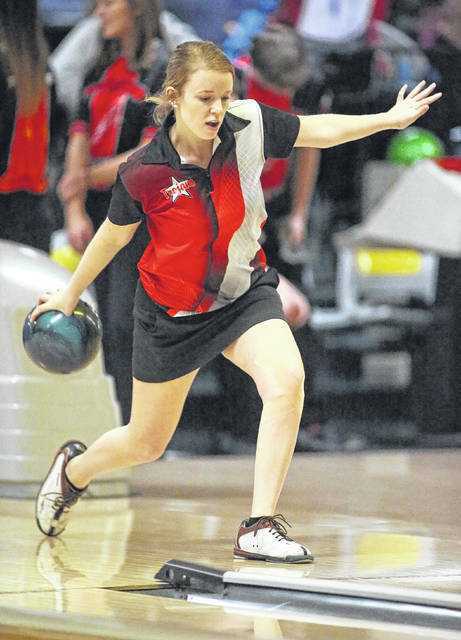 Lee Woolery|Miami Valley Today Troy’s Stephanie Crider bowls Thursday against Tippecanoe. Lee Woolery|Miami Valley Today Troy’s Preston Gambrell bowls Thursday against Tippecanoe. 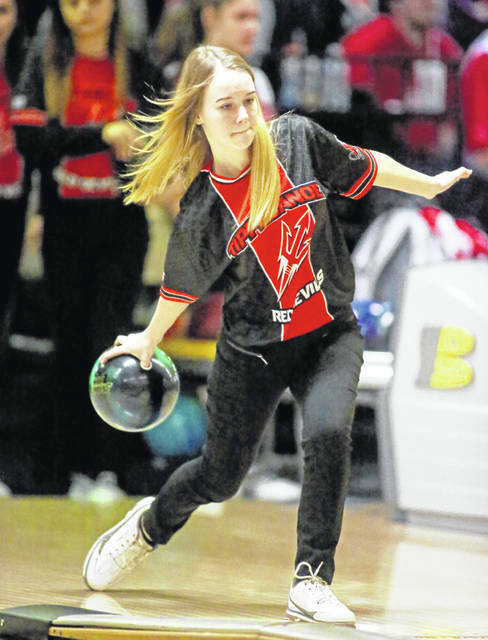 Lee Woolery|Miami Valley Today Troy’s Kylie Schiml bowls Thursday against Tippecanoe. Lee Woolery|Miami Valley Today Troy’s Jordan Fisher bowls Thursday against Tippecanoe. Lee Woolery|Miami Valley Today Troy’s Adara Myers bowls Thursday against Tippecanoe. 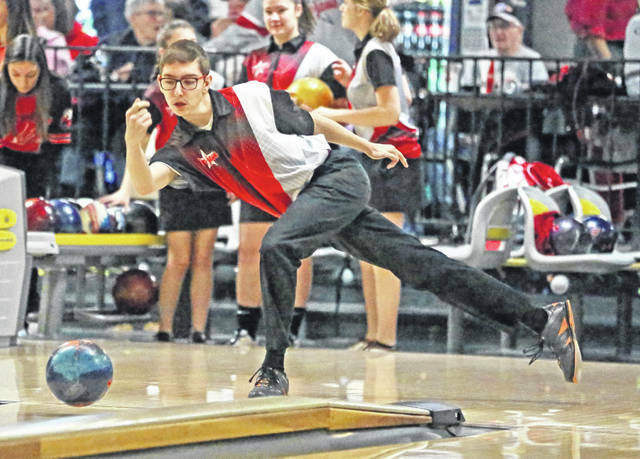 TROY — The Troy bowling team has taken a tour of the top teams in the Greater Western Ohio Conference American North Division since returning home to Troy Bowl this week. And after a solid day against Butler Tuesday, the Trojans had an even better one against Tippecanoe Thursday. The Troy girls — the five-time defending division titleholder, as well as last year’s outright champion — continued to distance themselves from the rest of the pack by knocking off second-place Tippecanoe 2,378-1,574, while the Trojan boys pulled into a second-place tie in the division with a 2,393-2,201 victory over the Red Devils to complete a sweep Thursday at Troy Bowl. On the girls side, Tippecanoe entered the day tied for second place in the division with Butler — which Troy beat on Tuesday — at 4-4. But the Trojans posted their best head-to-head team score of the season and remained undefeated in North play come day’s end to improve to 10-1 overall and 9-0 in the GWOC American North, while Tippecanoe fell to 6-5 and 4-5 in the division. And Troy’s three seniors led the way on the day, too. Cassidy McMullen rolled 210-220—430, Stephanie Crider rolled 224-190—414 and Alyssa Shilt rolled 234-171-405 to set the pace, with freshman Kayleigh McMullen hitting the 400-series mark even by rolling 206-194 and Adara Myers adding a 188 game. With that kind of production, the Trojans took a 999-683 lead after the first game of regular bowling and then a 1,962-1,418 lead heading into the baker round. Troy then beat team in the baker games 191-108 and 225-148 to close things out. For Tippecanoe’s girls, Ashlyn Herzog led the way, rolling 170-143—313, McKenzie Dean rolled 133-174—307, Abigail Lee rolled 124-160—284, Emma Lara 139-142—281 and Alison Johnston rolled 117-116—233. And on the boys side, Troy was coming off of a loss to 8-0 division leader Butler on Tuesday, while Tippecanoe remained a game back entering Thursday’s action at 7-1 after a win over Greenville on Wednesday. But once the dust settled, Troy improved to 9-2 overall and 7-2 in the division, while the Devils fell to 8-3 overall and 7-2 in the North, both tied behind the Aviators. “We bowled very well today,” Troy boys coach Doug Stone said. “Everybody that you bowl, it’s always tough, because you never know what you’re going to get into. Tipp City, I know they can be competitive. They’ve got a really good team. But coming out on top is always fun. Troy’s boys had three bowlers crack the 400 mark. Carson Rogers rolled 253-210—463, Jordan Fisher rolled 206-254—460, Preston Jackson rolled 226-204—430, Preston Gambrell rolled 184-156—340 and Brayden Ganger added a 163 game. Tippecanoe kept pace early, trailing 1,067-1,003 after the first regular game. But Troy extended its lead to 2,054-1,881 heading into the baker rounds and remained consistent, topping the Devils 170-160 and then tying them 160-160 for the final margin. James Ridgeway led the Devils by rolling 235-222—457, Austin Post rolled 213-191—404, Taylor Riggle rolled 198-166—364, Dalton Grimmett rolled 155-180—335 and Aaron Davis added a 202 game. Both teams will be in tournament action on Monday — weather permitting — with Tippecanoe traveling to Beaver-Vu Lanes for the Baker Bash Tournament and Troy traveling to Lima’s 20th Century Lanes for the Pioneer Classic. 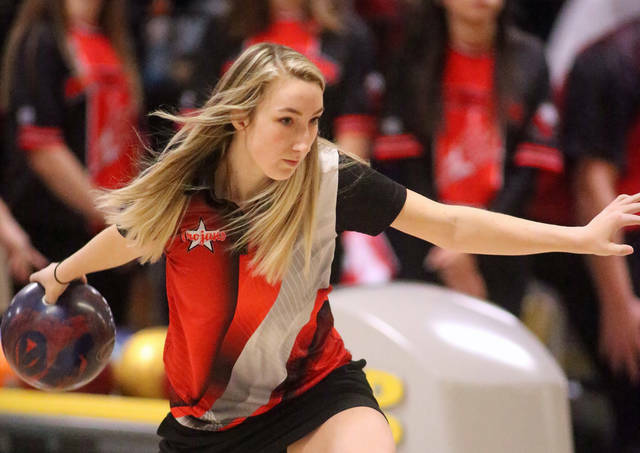 https://www.weeklyrecordherald.com/wp-content/uploads/sites/51/2019/01/web1_011719lw_troy_cassiemcmullen-1.jpgLee Woolery|Miami Valley Today Troy’s Cassie McMullen bowls against Tippecanoe Thursday at Troy Bowl. https://www.weeklyrecordherald.com/wp-content/uploads/sites/51/2019/01/web1_011719lw_troy_carsonrogers-1.jpgLee Woolery|Miami Valley Today Troy’s Carson Rogers bowls Thursday against Tippecanoe. 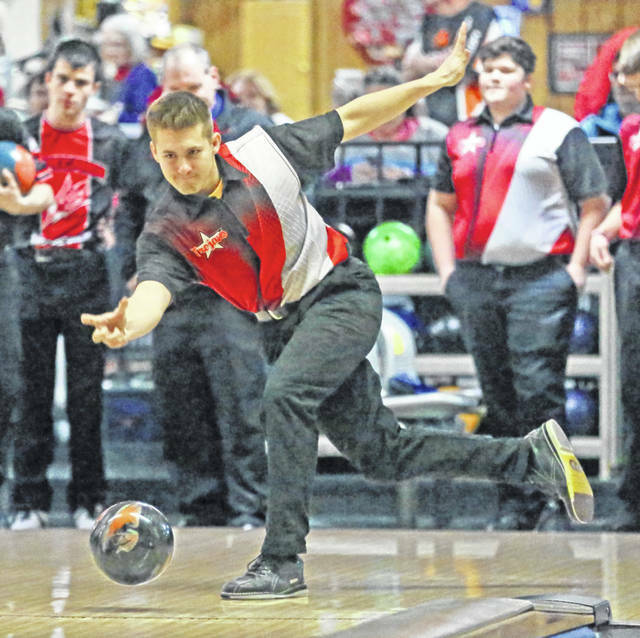 https://www.weeklyrecordherald.com/wp-content/uploads/sites/51/2019/01/web1_011719lw_tipp_jamesridgeway-1.jpgLee Woolery|Miami Valley Today Tippecanoe’s James Ridgeway bowls Thursday against Troy. 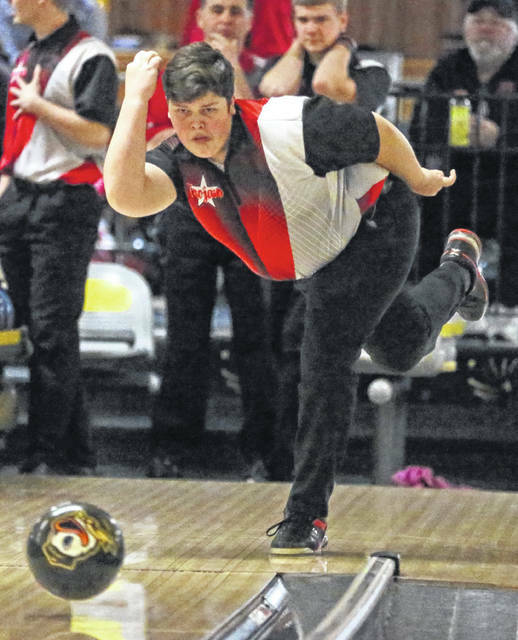 https://www.weeklyrecordherald.com/wp-content/uploads/sites/51/2019/01/web1_011719lw_tipp_mckenziedean-1.jpgLee Woolery|Miami Valley Today Tippecanoe’s McKenzie Dean bowls Thursday against Troy. https://www.weeklyrecordherald.com/wp-content/uploads/sites/51/2019/01/web1_011719lw_troy_prestonjackson-1.jpgLee Woolery|Miami Valley Today Troy’s Preston Jackson bowls Thursday against Tippecanoe.  https://www.weeklyrecordherald.com/wp-content/uploads/sites/51/2019/01/web1_011719lw_troy_alyssashilt-1.jpgLee Woolery|Miami Valley Today Troy’s Alyssa Shilt bowls Thursday against Tippecanoe. https://www.weeklyrecordherald.com/wp-content/uploads/sites/51/2019/01/web1_011719lw_tipp_abbeylee-1.jpgLee Woolery|Miami Valley Today Tippecanoe’s Abbey Lee bowls Thursday against Troy. 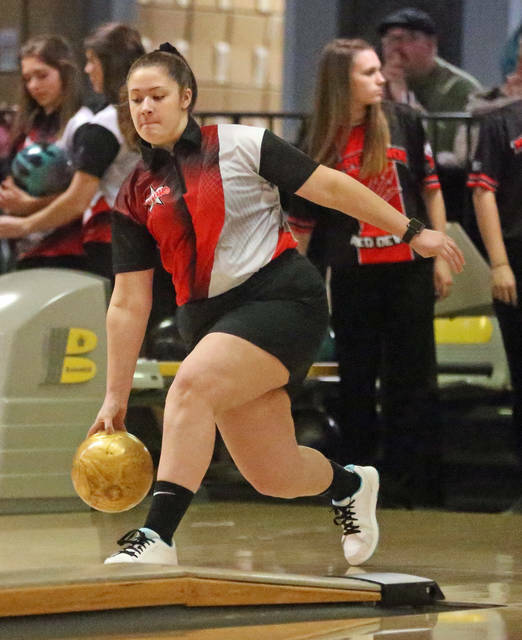 https://www.weeklyrecordherald.com/wp-content/uploads/sites/51/2019/01/web1_011719lw_troy_kayleighmcmullen-1.jpgLee Woolery|Miami Valley Today Troy’s Kayleigh McMullen bowls Thursday against Tippecanoe. 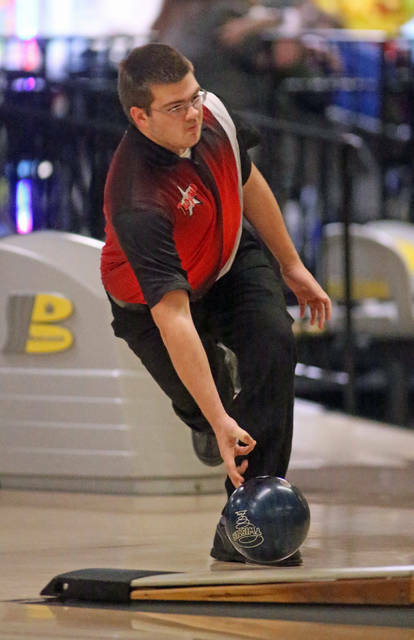 https://www.weeklyrecordherald.com/wp-content/uploads/sites/51/2019/01/web1_011719lw_troy_drewsnurr-1.jpgLee Woolery|Miami Valley Today Troy’s Drew Snurr bowls Thursday against Tippecanoe. 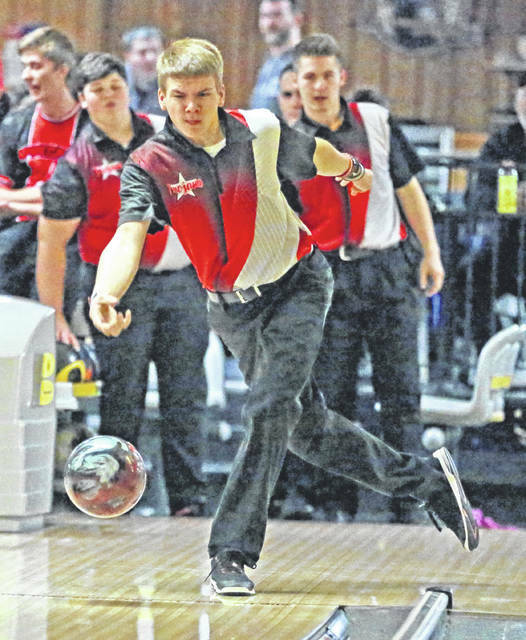 https://www.weeklyrecordherald.com/wp-content/uploads/sites/51/2019/01/web1_011719lw_troy_braydenganger-1.jpgLee Woolery|Miami Valley Today Troy’s Brayden Ganger bowls Thursday against Tippecanoe. 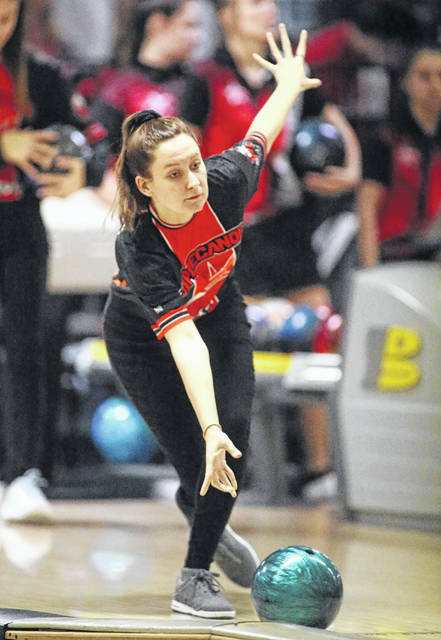 https://www.weeklyrecordherald.com/wp-content/uploads/sites/51/2019/01/web1_011719lw_troy_stephaniecrider-1.jpgLee Woolery|Miami Valley Today Troy’s Stephanie Crider bowls Thursday against Tippecanoe. https://www.weeklyrecordherald.com/wp-content/uploads/sites/51/2019/01/web1_011719lw_troy_prestongambrell.jpgLee Woolery|Miami Valley Today Troy’s Preston Gambrell bowls Thursday against Tippecanoe. https://www.weeklyrecordherald.com/wp-content/uploads/sites/51/2019/01/web1_011719lw_troy_kylieschiml.jpgLee Woolery|Miami Valley Today Troy’s Kylie Schiml bowls Thursday against Tippecanoe. https://www.weeklyrecordherald.com/wp-content/uploads/sites/51/2019/01/web1_011719lw_troy_jordanfisher.jpgLee Woolery|Miami Valley Today Troy’s Jordan Fisher bowls Thursday against Tippecanoe. https://www.weeklyrecordherald.com/wp-content/uploads/sites/51/2019/01/web1_011719lw_troy_adaramyers.jpgLee Woolery|Miami Valley Today Troy’s Adara Myers bowls Thursday against Tippecanoe. 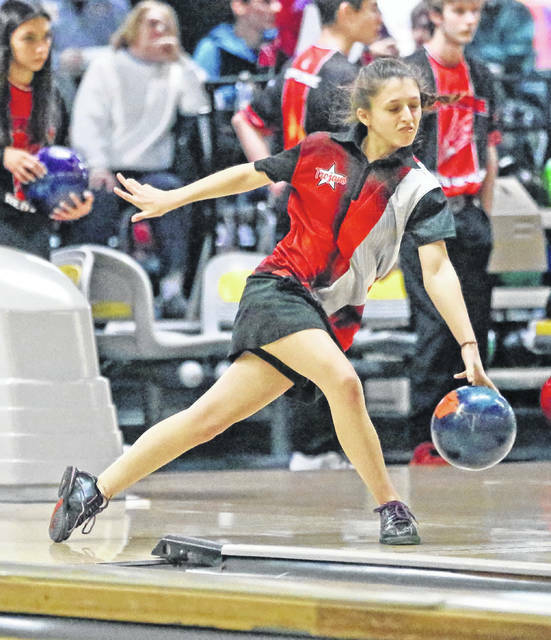 https://www.weeklyrecordherald.com/wp-content/uploads/sites/51/2019/01/web1_011719lw_troy_stephaniecrider2.jpgLee Woolery|Miami Valley Today Troy’s Stephanie Crider bowls Thursday against Tippecanoe.